Nowadays, it is estimated that more than 100 million people around the world wear contact lenses. These items are very popular and technology improves them daily making them even more desirable. There are people who wear contact lenses, instead of glasses, for esthetical reasons. They like themselves better with contact lenses than with glasses. Another reason that determines people to wear contact lenses is the cosmetic one. There is a great variety of decorative contact lenses that can change the eye’s appearance. And there are those who appreciate their practical side. They cannot play certain sports with glasses; they use devices that are incompatible with glasses etc. There is that category of people who are forced to wear contact lenses for therapeutic reasons. In their case, the contact lens is not an option. The contact lens can be a bandage in the healing process of different diseases or injuries of the cornea and it is a luxury that heals. There is also a combination between the two reasons – colour lenses with correction power which actually please a lot of persons. 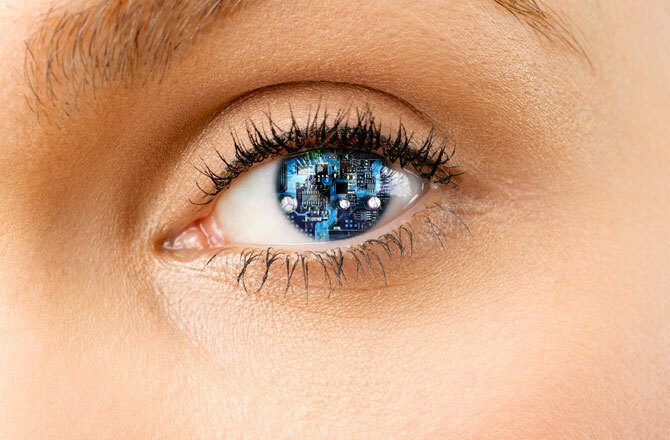 The first contact lenses ever made were developed out of glass. After that, new types appeared, as the ones made of Plexiglas and the rigid gas permeable ones, but, nowadays, the soft contact lens is the most appreciated. Modern materials include silicon hydrogel or other plastic polymers like etalficon A, galyficon A, senofilcon A (used in the fabrication of Acuvue contact lenses). Rigid gas permeable contact lenses are recommended to the persons with dry eyes as these lenses contain no water that could evaporate during the wearing. If you decide to wear contact lenses, you first have to go to an ophthalmologist, no matter what your reason may be. The doctor will be the one to decide which type of contact lenses fit your eyes best. Different factors will be considered for the prescription of a certain contact lens: the material (the silicon hydrogel is one of the newest discoveries in the field), the wearing time (daily wear, extended wear or continuous wear), the shape (spherical, toric or multifocal) and many more. Depending of the material, the contact lens can be either rigid or soft. The rigid one can be gas-tight or gas-permeable, but the soft one is always gas-permeable. There can also be a further classification made on the moisture content, on the amount of water in the contact lens. A daily contact lens is safer as the risk of infection is lower than at the long term contact lens. This type does not require cleaning, being single-use only. It is sterile. And it even keeps you away from spending money on cleaning or storage solutions. On the other hand, the extended wear type of contact lenses allows people to easily wear contacts for a longer period while allowing oxygenation (they usually have a high oxygen permeability rate). Some people prefer them as their convenience is obvious, but the risk of infection is higher than at the daily type of contact lenses due to the bacterial stagnation, dust accumulation and so on. One of the most popular contact lenses brand in the world is Acuvue, produced by Johnson & Johnson’s subsidiary Vistakon Company. They provide both vision and esthetical contact lenses. They design disposable lenses, making types that are to be replaced every two weeks (Acuvue, Acuvue 2, Acuvue 2 Colors, Acuvue Advanced and Acuvue Oasys) or less (1-Day Acuvue). They’ve also started making extended wear lenses. Contact lens quality is very important. Low-quality contact lenses can damage the eye, causing irritations or hurting the eyelid or the cornea. Attention must be paid to the way the lenses are worn, kept and cleaned because, even if they are high-quality, they present different risks. So, the contact lenses must be bought from specialised stores after consulting a doctor. Places where these items are available can be found anywhere as the contact lenses are very popular. Another tendency is to acquire them from an on-line store. This method can even be less expensive and still offer the same quality. You just need the prescription. But be careful and only choose reputable stores. Your health is at stake.